All Training Equipment usually comes packed in poly bags & then master boxes. Customized printed retail boxes packing solutions are also available. Other packing facilities also available. All depends upon order quantity, rest around 2-3 weeks. Metal 4 Spike at the base for insertion to ground. Available in different colors, Other Sizes also available. 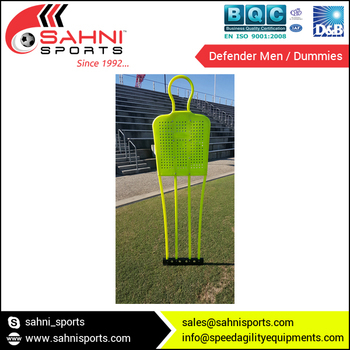 We are widely recognized for developing impeccable quality Training Equipment that is used for training purposes in various sports, namely football, cricket, rugby, basket ball, tennis etc. Our range of training gears is appreciated for their immaculate quality and precise dimension, which is formed with the help of innovative technique and designs. We employ high grade raw material and manufacture them under the supervision of experienced professionals. Sahni Sports is fully committed towards providing products as per customer specification. We work as a team in order to achieve our customer's specifications. All products are available in different colors & Products can be customized with different LOGO options; logo can be printed on the products or by Stickers. Logo can also be printed on the carry bags wherever bags are applicable. Established in 1992 in the heart of Sports City Meerut by Mr. Balbir Sahni, self-motivated and hardworking men who started this business from a very small scale with limited resources by manufacturing simple Cricket Bat Cover for one of the biggest company in Cricket. The business started growing slowly and Mr. Sahni started making Sports Bags, Kit Bags, Bat Covers, Punching Bag, Training Bibs, Soccer Accessories etc.. and started selling all around India. In 1997 by the hard work of Mr. Sahni and god's grace SAHNI SPORTS shifted to new bigger premises with setup of lot of goals in mind and he succeeded because of his principles & commitments and making of a quality product's. 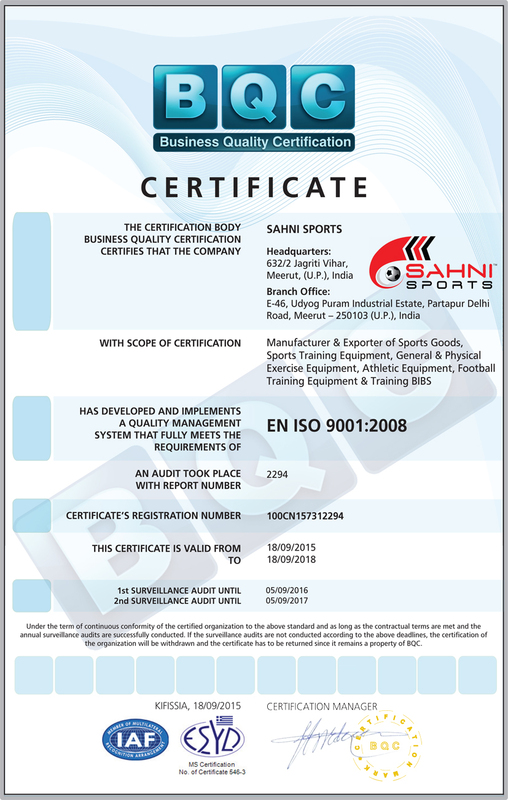 Now SAHNI SPORTS is run by Mr. Puneet Sahni (from 1999) & Mr. Vineet Sahni (from 2006) under the guidance and principles of their father Shri. B.B Sahni and started Exporting there products all around the globe. In 2010 SAHNI SPORTS is setup at more bigger space of around 15000 Sq. Ft. with 2 different manufacturing units in Meerut. Our success has its roots in our commitment to manufacture quality products and deliver them within the given time. Our business policies are totally focused on our customer requirements and then after achieving full customer satisfaction. We are currently indulge in manufacturing & exporting 800+ products and our wide selection of Sports Goods & Training Equipment suiting different sports market segments right from Speed & Agility Equipment (Speed Chute, Resistance Harness etc..), Soccer Football Training Equipment (Agility Ladder, Speed Hurdles etc..), Athletic Equipment, Fitness Equipment, Inflatable Balls, Soccer Accessories, Training Bibs, Referee Accessories, Rugby Products, Training Cones & Markers, Football Coaching Equipment and much more. All of our products are manufactured as per international specifications. At SAHNI SPORTS, we design our products as per international specifications and with a strong emphasis on safety, quality, innovation & durability. Our major aim is to provide Sports Equipment and Services to our clients with the best prices by maintaining cost effectiveness, time and quality. Our only satisfaction lies in the satisfaction of our customers and we believe in supplying quality sports goods and equipment on time, so that we retain our customers for years to come. Rest you will come to know when we will serve you with our product quality & services. Owing to the implementation of modern techniques in product designing and development our products meet the defined quality & construction parameters. We are Registered Member of "SPORTS GOODS EXPORT PROMOTION COUNCIL" Govt. of India Body.